New tiers improve customer experience and provide more business continuity options To better serve your needs for more flexibility, Microsoft Azure SQL Database is adding new service tiers, Basic and Standard, to work alongside its Premium tier, which is currently in preview. Together these service tiers will help you more easily support the needs of database workloads and application patterns built on Microsoft Azure. Additionally, the new Premium functionalityannounced earlier this month at the Microsoft BUILD conference is now available to try. Previews for all three tiers are available today. The Basic, Standard, and Premium tiers are designed to deliver more predictable performance for light-weight to heavy-weight transactional application demands. Additionally, the new tiers offer a spectrum of business continuity features, a stronger uptime SLA at 99.95%, and larger database sizes up to 500 GB for less cost. The new tiers will also help remove costly workarounds and offer an improved billing experience for you. Basic: Designed for applications with a light transactional workload. Performance objectives for Basic provide a predictable hourly transaction rate. Standard: Standard is the go-to option for getting started with cloud-designed business applications. It offers mid-level performance and business continuity features. Performance objectives for Standard deliver predictable per minute transaction rates. Premium: Designed for mission-critical databases, Premium offers the highest performance levels and access to advanced business continuity features. Performance objectives for Premium deliver predictable per second transaction rates. Within the new service tiers, we are introducing performance levels, which are assigned a defined level of throughput that you can easily dial up or down to support database performance demands. This new service design offers greater predictable performance across multiple levels and the ability to more easily meet light-weight to heavy-weight database performance needs. You can also now more seamlessly blend the service tiers together to support modern application designs. Starting today, new business continuity features are also available across the Basic, Standard, and Premium previews. For many, these built-in continuity features will remove costly import/export and data sync workarounds. Self-service restore: Restore service offers self-service control over data restoration from available backup data, putting the power to restore in your hands in case of “oops recovery.” Learn more about self-service restore. 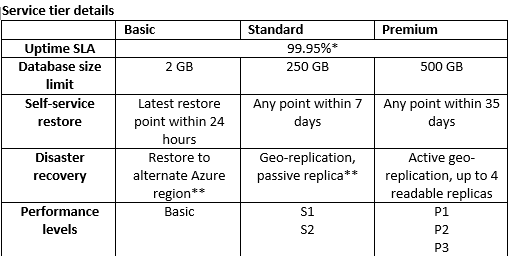 Active geo-replication: Premium offers active geo-replication, which allows you to create up to 4 readable secondaries in any Azure datacenter and control when and where to failover. Learn more about Active Geo-Replication. There is no change to your use of Web and Business today. Azure SQL Database Web and Business will be retired in 12 months, and will be replaced by the new Basic, Standard, and Premium tiers. Microsoft will ensure you have at least 6 months from Basic, Standard, and Premium general availability to migrate from Web and Business, even if this involves extending the 12 month window. We’re excited about opportunity the new services tiers and added functionality will offer you to support your continued innovation on Azure! If you haven’t tried Azure SQL Database yet, it’s a great time to start! Start a free trial today!